Between Worlds: The Art of Bill Traylor is a genuinely unfathomable account. There is no comparison to Bill Traylor’s (1853–1949) artistic experience and there is no precedence to its inclusion in the canon of art history. His is the only record of a cohesive artistic collection of any slave-born, illiterate, self-taught, African American. At various times considered “cave art,” “folk art,” “outsider” art, “art brut,” Traylor’s work is nothing of the sort. Instead, the following words and phrases suit more accurately and appropriately: “unerring sense of design;” “tension . . . humor . . . danger;” “whimsical yet sinister;” “near perfect balance of compositional elements;” “hyperbolic sense of observation;” “sophisticated;” “artistically sensitive with symbolic depth;” “astonishing, bold and enigmatic;” and above all a demonstration of a fundamental human “determination to exist, be visible, and employ personal agency to impact and shape his surroundings.” Traylor’s is a category all his own. By defining art as a means and method of communication across times and cultures, there is little doubt that Bill Traylor was indeed an important historical artist. Umberger takes great care in flushing out the worlds between that Traylor’s depictions historically dangled. The worlds referred to in this case are multi-layered spanning an era of “Black Belt” plantation slavery, Union/Confederacy politics, the Emancipation Proclamation, Wilson’s Raiders, Amendments Fourteen and Fifteen, Reconstruction, Jim Crow/Plessy v. Ferguson urban segregation laws, the Great Depression, and World War II. Traylor witnessed it all as an oppressed individual on the losing side of southern history. Not until he reached his 80s did he have occasion and opportunity to finally pour out his experiences, memories, opinions, and observations on paper to communicate in his own style. His themes were centered around the home, spirituality, work, play, freedom and dignity, and the dichotomies that surround those arenas. He succeeded in creating a powerful visual representation of the most poignant period in American history from the most omitted point of view. What Umberger has done is equally as powerful. Over seven years of intense and careful research, interviews, frustrated stymied fact checking, and intelligent assessment of a thousand drawings, she has created the ultimate justification for the value of Traylor’s work and, by logical extension, of other non-categorizable artists. As curator of folk and self-taught art at the Smithsonian American Art Museum (SAAM), she is an advocate for art that falls outside of the established lineage of “isms,” relocating it into mainstream American thought. Within this purview, she has written an authoritative document to give Traylor the scholarly attention and legitimacy he deserves. This hefty volume is divided into two main sections. The first section, The Life of Bill Traylor, explores the genealogy of both the black and the white Traylor families (the slave Traylors and the plantation owner Traylors) starting around 1805. Regional Alabama history takes front and center in this part of the story. Education, county records, slave economy, and cotton all played a role in defining the black and white cultures. Traylor’s life is described as if perusing a family tree with a member of a younger generation and trying to recall anecdotes of long ago to pass on and create legacy connections. Traylor was married three times and fathered at least 14 children. He worked as a laborer on the same plantation on which his father’s family was enslaved. He saw chaos, calamities, violence, and vendettas, as well as frolicking, mischief, social bonding, and cultural rituals. With over 200 drawings reproduced as examples of various techniques or themes, there is much information to digest. Umberger’s unsurpassed skill as a historian and writer, cuts easily through it all revealing depth and dimension. For the reader not intimidated by the bulk of this volume, approaching six pounds, there is much reward and there are too many insights to list. Even 70 years after his death, his life experience remains critically important to our contemporary settings. 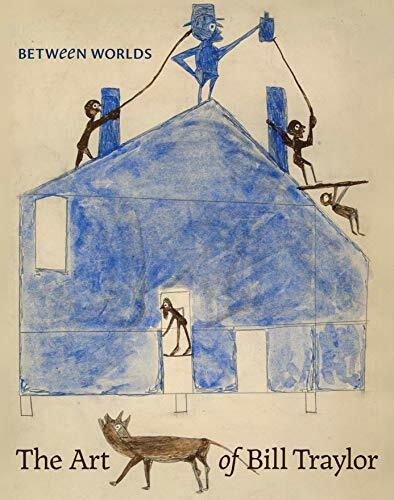 Between Worlds: The Art of Bill Traylor also serves as the catalog for the six-month-long SAAM exhibition by the same name. Beyond being a monograph about an artist from an action packed period in history, the bigger picture addresses the evolving nature of art, who is considered an artist, and how to incorporate these treasures into our own personal, cultural, and national identities.